Hi folks! My name is Owen and I think you owe it to yourself to check out a beautiful 1 1/2 year boy old like me! I’m a goofy kid that appreciates all life has to offer – good puns, long walks in the Gorge, and gourmet cheese dipping sauce are just a few of my favorite things! At 73 lbs there is no denying my German Shepherd heritage although my adorable white speckled paws prove that I’m mixed with pure awesome. I do well with other dogs, excited around kitties but could be easily managed with a dog-savvy cat and am perfect with all people who admire my size and energy level. To help keep my youngster energy in check it would be great to cultivate my mind and puppy classes are an ideal place to bring out my intellectual side! 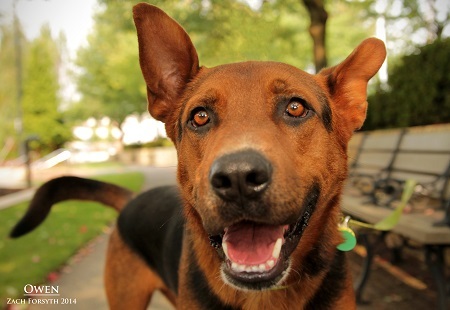 Do I sound like the fun-loving, well rounded pooch you have been looking for? Fill out an application at pixieproject.org so we can schedule a meet and greet. I am fixed, vaccinated and microchipped. My adoption fee is $250.